[119 Pages Report] on Metal Foam Market, such as aluminum foam, nickel foam, copper foam, and tungsten foam, used in various industries. In terms of value, the metal foam market was valued at USD 79.0 Million in 2016 and is projected to reach USD 99.8 Million by 2022, at a CAGR of 4.05% between 2017 and 2022. Metal foam offers various useful properties, such as high porosity, high strength, high energy absorption, and impact resistance, among other properties. The various end-use industries of metal foam include automotive, construction & infrastructure, and industrial. 2016 has been considered as the base year for company profiles. Whenever information was unavailable for the base year, the years prior to it have been considered. Various secondary sources, including company websites, encyclopedias, directories, and databases such as metalfoam.net, Factiva, and Live Science, among others, have been referred to understand and gain insights into the metal foam market. 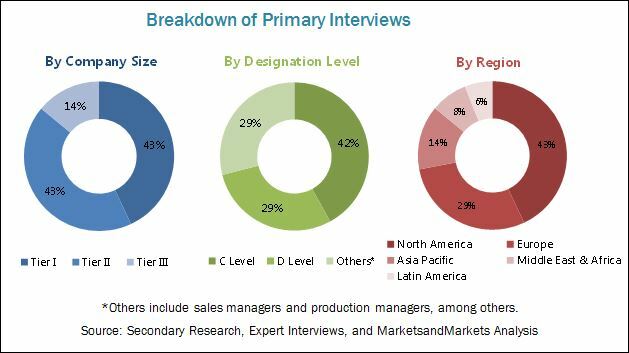 Experts from top metal foam companies have been interviewed to verify and collect critical information and to assess the trends in the metal foam market during the forecast period. The top-down, bottom-up, and data triangulation approaches have been implemented to calculate the exact values of the overall parent and individual market sizes. The raw materials required for the manufacturing of metal foams include aluminum, copper, and nickel. Major raw material suppliers of metal foams include Hydro and MM Kembla, among others. Key players in the metal foam market include Cymat Technologies Ltd. (Canada) and ERG Aerospace Corporation (US), among others. This research report categorizes the metal foam market on the basis of application, end-use industry, material type, and region. It forecasts revenue growth and analyzes trends in each of these submarkets till 2022. Metal foam is a cellular structure consisting of solid metal. Gas-filled pores comprise a large portion of the metal foam’s volume. In most of the cases, five to twenty-five percent of the volume consists of base metal, making metal foam a very light material. The most defining characteristic of the metal foam is its porosity. Metal foams have increasingly gained acceptance in various end-use industries, such as automotive, construction & infrastructure, industrial, and aerospace, among others. 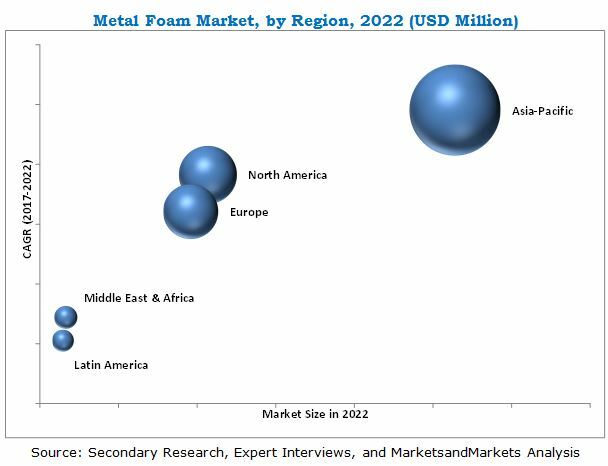 The global market size of metal foam in terms of value was USD 79.0 Million in 2016, which is anticipated to reach USD 99.8 Million by 2022, at a CAGR of 4.05% from 2017 to 2022. The report focuses on various metallic foams, such as aluminum foam, nickel foam, copper foam, and tungsten foam used in various industries. Metal foam offers various useful properties, such as high porosity, high strength, high energy absorption, and impact resistance, among others. These properties enable metal foams to be used in various applications, such as anti-intrusion bars, heat exchangers, and sound absorbers. The metal foam market has been segmented on the basis of application, end user industry, material, and region. Among applications, the anti-intrusion bars segment accounted for the largest share of the metal foam market in 2016, in terms of both value and volume. Anti-intrusion bars are mostly used in ground vehicles and passenger cars to protect passengers from side impacts. They play an important role in absorbing the kinetic energy of colliding vehicles. The high energy absorption property of metal foams makes them an ideal material for use in anti-intrusion bars. By material, the aluminum foam segment accounted for the largest share of the metal foam market in 2016. Aluminum foam offers various useful properties, such as thermal conductivity, electrical conductivity, high porosity, and corrosion resistance. The metal foam market in Asia-Pacific is witnessing a significant growth, in terms of both value and volume. The end user industries in this region are continuously focused on the usage of metal foams owing to their useful properties, such as high porosity, low weight, energy absorption, high impact strength, and good thermal conductivity, among others. The metal foam market is growing on account of the increasing usage of metal foams in various end-use industries. However, the major restraint for the metal foam market is the difficulty faced in the bonding, welding, and soldering of metal foams. ERG Aerospace Corporation (US), Admatis Ltd. (Hungary), Hunan Ted New Material Company Ltd. (China), and American Elements (US) are some of the major market players. These players have adopted several organic and inorganic growth strategies to achieve growth in the global metal foam market. 12.8 Hunan Ted New Material Co. Ltd.
12.10 Shanghai Zhonghui Foam Aluminum Co. Ltd.
12.11.2 Dalian Thrive Mining Co., Ltd.
12.11.9 Shan XI Putai Aluminum Foam Manufacturing Co., Ltd.
12.11.15 Liaoning Rontec Advanced Material Technology Material Co., Ltd.